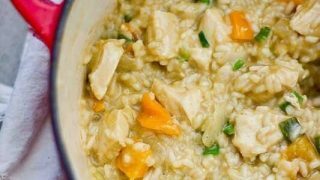 One Pot Chicken Risotto is a delicious, simple, and easy dish – just add ingredients and stir for a creamy restaurant quality risotto at home! Be sure to scroll to the bottom of the post for the recipe – but find some very important cooking tips in the post below! I love risotto. 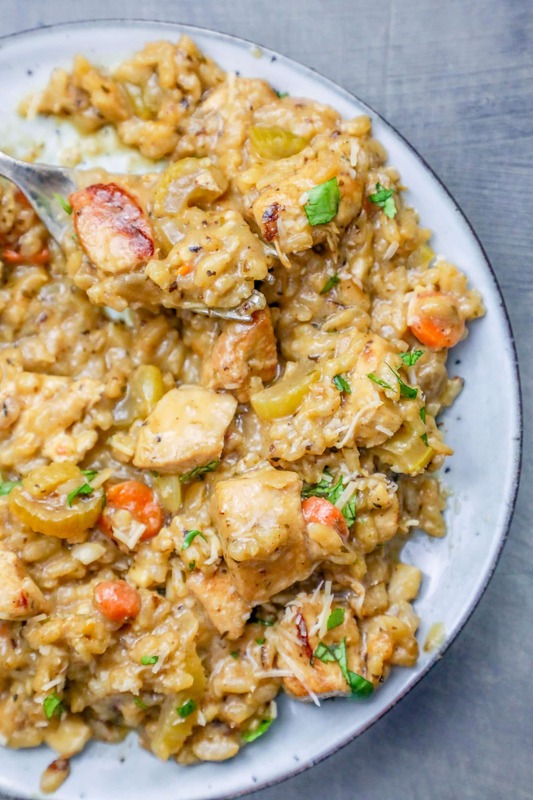 When thinking of easy weeknight meals, it isn’t always the top of our list- but this One Pot Chicken Risotto really should be! While it is a bit stir-intensive (you will be stirring this for about a half hour, not constantly but frequently), it really isn’t much other work- Just toss and stir! Also, you can easily adapt this recipe to what you have on hand. Think of it as a hearty, rustic peasant dish- if you have chicken stock or vegetable stock, use that instead. Have some asparagus and mushrooms instead of peppers and green onions? Use those! Be flexible and find the flavors you love. Also, I add vermouth in to the recipe because I love the flavor. You can skip this entirely, or add a different type of white wine. Try the vermouth sometime though- I cook with it all the time! Its fabulous to sauté mushrooms in and has a flavor that pairs wonderfully with risotto. The one thing that makes this recipe is the process. Don’t rush it. While this recipe will only take 30-40 minutes, don’t skip the steps or add to much liquid when stirring rice. This will keep your risotto from getting too gummy or runny! Also, YOU HAVE TO STIR VERY FREQUENTLY. I’ve made risotto both with and without cream, but the “creamy” texture comes from the rice giving off it’s starches. To do this, you need to STIR, BABY, STIR! It isn’t much work, but it is crucial! It’s a little odd because we’re used to stirring dishes just to prevent from burning- but this one needs to be stirred to get the right texture. It’s kind of like when you overwork bread and it gives the bread a weird texture and becomes too gummy- thats exactly what we want the rice to do because it makes the sauce creamy! My husband makes this with two pots- he heats up the stock in one, and pours it into the risotto from the other pot which sits on low. I usually just do it all in one pot with room temperature stock though- and I dont have a problem. Just add stock a little more slowly and stir a little more. If you like your risotto on the very soft side (it is supposed to be al dente, but some like it softer)- HEAT YOUR STOCK IN ANOTHER POT. This cuts waaay down on cook time. Some readers have had to add more time as it cooks to get to be completely soft. If you are rushed for time, cook it at a much higher heat (medium high to high), stirring frequently, and add more liquid. This will speed it along faster. As a reader noted, this makes a TON of risotto. We like making big batches because it is a super delicious leftover food, and that means a few less meals to cook (if it even lasts that long). Feel free to cut it in half if you have a smaller family. To get a perfect creamy leftover risotto, you’ll want to heat it up quickly, without adding much liquid to it (or it will turn to mush). I like to melt about 2 tbsp butter and then add the risotto to it in a pan, stirring to mix well until hot. This dish also reheats great in a microwave for work meal-prep! If you love this recipe, be sure to check out my other risottos! It is such a fun and versatile dish, you’ll love trying different flavors! One note: this method will work perfectly with other meats, but don’t use this for shrimp. Instead of cooking the shrimp at the beginning, start the veggies and then add the shrimp towards the end of the process- just toss in and cook until opaque- otherwise your shrimp will be totally overcooked gummy and gross. Add a little bit of stock and vermouth (optional!! )- just enough to keep the consistency liquid. Realistically, using a regular sized container of stock, you'll use it in about 6ths or 8ths. Add diced green onions just before your risotto is done cooking- you won't want them to overcook. If using frozen peas, add them with the last addition of stock so they thaw and cook just briefly. I’m a mess in the kitchen, never made risotto before and it’s a total disaster. :/. I like the idea of one pot but I’m thinking I’ll cool the rice by itself and add it seperate next time, and yes my rice took forever to cook. :/. Just a suggestion to update your post so readers don’t have to read all through the comments to find answers. Yeah that works well for my 3 year old but the 1 year old isn’t interested enough yet. You said it’s good reheated though right? Maybe I could make it while they’re napping and reheat it at dinner time. I’m making this right now and it seems like a lot of chicken. Did you use two whole breasts or two halves. I used two whole and I keep having to drain the pot (large Le Crueset dutch oven) because it is creating so much liquid that it is steaming and not browning. I used two halves. I will make a note of that ASAP. You could use the rest tomorrow for a salad? Thanks Courtney. Next time I’ll just use two halves, but is was still delicious, my guys loved it! Can’t wait to try other combinations! We are at close to 7000 ft altitude, I followed your directions to a T, an hour and ten minutes and the rice isn’t close to al dente. ahhhhhh! It doesnt help that I have a hungry toddler at my feet hah! Next time, I’ll start earlier! ahhh! oh no stacie! Next time, try cooking the stock in a small saucepan next to the risotto. Its not one pot, but it might speed things up. I havent had a problem with cooking time, but that will help reduce it for you. Believe it or not, you can use a pressure cooker to make risotto, which might be helpful if you’re at altitude. I haven’t done it (I live on a beach!) but just read about it when I googled “Basic Dairy Free Risotto” – they say to sauté the rice as usual, then add all the broth and pressure cook 7-10 minutes. 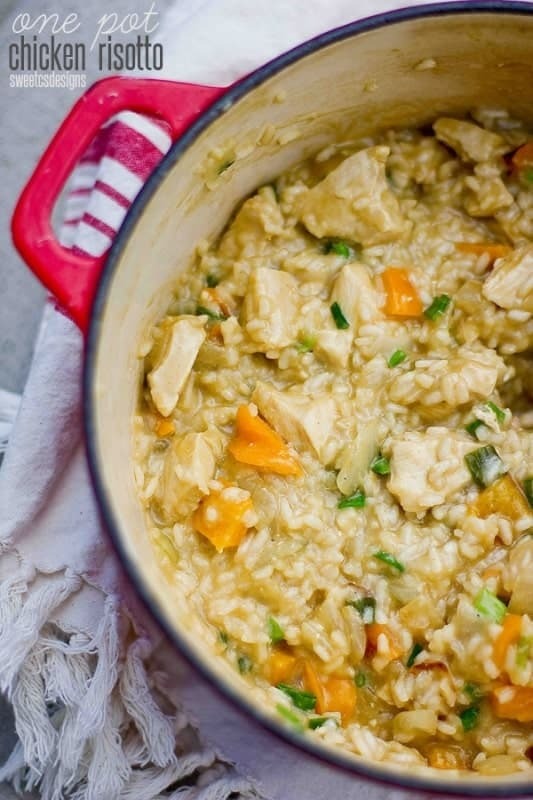 I imagine you’d want to do the chicken and veggies separately so they don’t disintegrate and add them in after (so not one pot) but it might be worth experimenting with if you really like risotto and don’t want to spend hours making it. I absolutely love this recipe. Would you happen to have the calorie information on this? Thank you! Let me look into it Chloe! Most risotto recipes require you to heat up the broth before you add to the rice. It messes with the cooking process when you don’t heat the broth up – it cools it down when you add it to the rice and then it has to heat all the way back up again. For those of you who live in high altitude where its very dry, you will end up having to cook the risotto twice as long – I finally got there after an hour off cooking and stirring. Waaayyyyyy tooooo llllloooonngg. Heather, I do make a note that traditionally, you’d heat the broth… but to make it one-pot you can add room temp broth. I’m at 5,000 feet and its always 35 minutes to a perfect al dente… but heating isn’t a bad idea if you don’t mind the extra pot! One thing that helps: add just a little at a time, and then it heats very quickly. Requires a little more stirring, but one less pot. I’m about to make this for dinner, and I’m EXCITED! Question, though: why beef stock when it’s a chicken dish? Its just an optional thing- I like that the beef stock adds a little more flavor (and tastes a little saltier). But chicken stock works great too! This was delicious! I made it tonight, and we just finished eating it. So filling! We had sweet potatoes on hand, so instead of green onion, that went in! Thanks for this, it is budget-friendly and makes a ton! Yay! So glad you liked it. 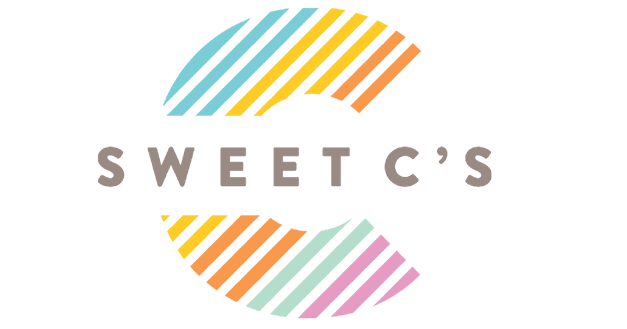 Sounds so good with sweet potatoes- I’ll have to try that! This is a totally versatile recipe- I love to change it up and try different veggies! I’m a disaster in the kitchen, but this was extremely easy to make (and yummy!). Oh yay! I am so glad to hear you liked it! Made this tonight for dinner–it was great! Added asparagus and some mushrooms. My 15 month old loved it and even his picky brother ate it. Thank you! So glad you liked it! This dish is awesome because you can turn it into lots of variations (which I have been doing a lot of lately!!!). You can try different veggies, meats, all kinds of stuff! Thanks so much for letting me know you liked it! 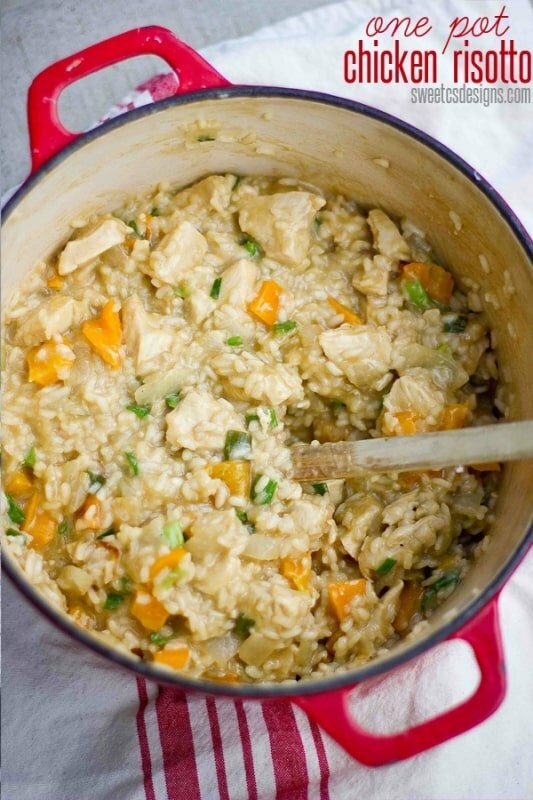 Question: Why beef stock instead of chicken stock when this is chicken risotto? Could you use chicken stock? You certainly can! I like the flavor of beef stock in this, but it is just a small preference. You can use beef, chicken, seafood, vegetable- any kind of stock! You need double the beef stock that she specifies and I would use 1/2 cup of white wine vs. vermouth. I also had to add a bit of water. 2.5 cups of rice is A LOT of rice and this recipe is HUGE. Cut in half if you have a small family. It took me a long time to stir and watch the rice. Probably close to 30 minutes. Jen, the brand arborrio Ive been using I use just one box of stock, but all are different. I’ll make a note! This is a huge recipe– it makes lovely leftovers. We like to eat this for lunches or dinner the next night. With 2 kids I try to make big recipes so we can always have leftovers but I will make that note! How much is a box/pkg or broth? Ounces? standard size boxes are around 14 ounces. Because you’re making this to your taste (if you like it softer, use more- more al dente use less) its not set in stone. hope that helps! Question… A package of beef stock means a box? what size of box? can you give ounces? standard size boxes are around 14 ounces. Because you’re making this to your taste (if you like it softer, use more- more al dente use less) its not a hard and firm rule. Can I use any rice or does it have to be arborrio rice? Thanks! You could use other rice, but it wont be as creamy. The starch in arborrio makes it much better- It is worth the extra time to find it! Luckily its much easier to find now and isnt too much more. Do you have any suggestions on how to make this ahead and reheat it? I think it would be great for my supper club on Friday night but want to make it ahead. Thoughts? Thank you- it looks delicious! Martha- it really is best fresh- but you could make it with a little extra liquid. Or, you can cook it to where it isn’t al dente (a little crunchier) and then add more stock to bring it all the way to the texture you’d like right before serving (about 10 minutes). Also, be careful to go easy on the salt. I find overtime it gets saltier. Try for low sodium stock, and add stock at the end right before serving if you need to- you dont want a salt bomb! Your risotto looks delicious!!! I love love love risottos, it’s one of those wonderfully comforting dishes to me! Yours looks absolutely delicious!!! Yum! 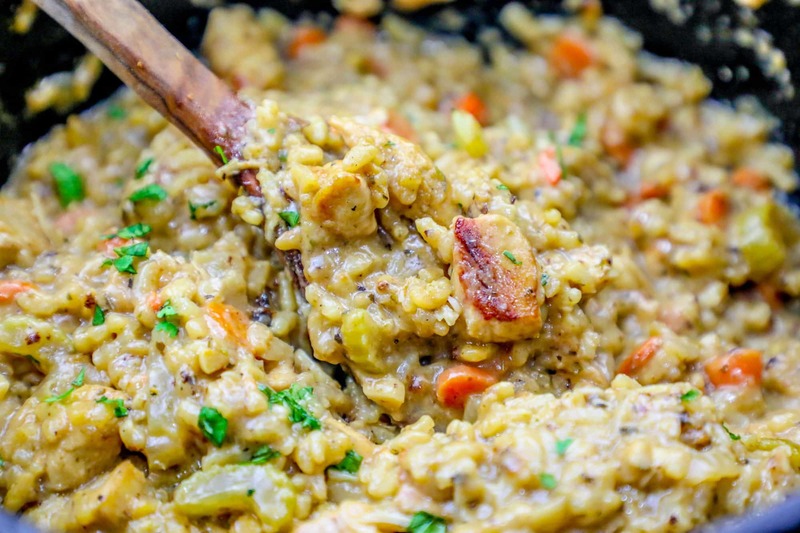 I love risotto and love the idea of making it into a one-pot meal! Totally worth the labor of love!